The first wireless detector and the first fully telescopic S-shaped stem. Each communicates with one another other via a real time digital radio link. 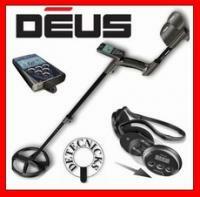 Save even more weight and control your Deus via the headset. The headphones can control the detector alone, enabling you to go detecting with an even more portable configuration (just 875g). Once programed via the remote control, the headphone controls enable you to access and adjust all the main detection settings: Programs, Sensitivity, Discrimination, Ground Balance, Frequency (4 kHz, 8 kHz, 12 kHz, 18 kHz), Multi-Tones, etc. Fold away your stem in just 5 seconds! The new patented "S TELESCOPIC "stem can be stored away instantly.